NEW YORK, Oct 24 2011 (IPS) - The Occupy Wall Street (OWS) movement has withstood political pressure, bad weather, police violence, and over a thousand arrests, and is continuing to grow in New York City a month in. It has spread to over 100 cities in the U.S. and many more worldwide, and is linking up with popular movements in Europe and the Arab World, and connecting itself to long-existing community organisations. By now OWS has been featured on the news all around the world, and there is no shortage of analysis regarding its potential political impact. But the internal organisation, structure and functioning of the occupations are at least as noteworthy. The story here is centred on the original Liberty Plaza, a.k.a. Zucotti Park, occupation, but there are many commonalities between this and other occupations, and most of them have similar structure. Still, each occupation is autonomous and run uniquely based on its own area, issues, demographics and situation. OWS is open, both literally and figuratively, and voluntary. People come and stay either because they believe in the message – that the economic system of the U.S. is fundamentally flawed and in need of radical change – or because they are victims of that system who are less able to live elsewhere, but either way the sense of community felt at Liberty Plaza is palpable. There are three roles people take on in the GA. The first is the facilitator, who guides the discussion and keeps conversation on topic and respectful, the stack-taker, who keeps track of people who raise their hands to speak, and calls on them in order, prioritising those who haven't already spoken, and everyone else. In the GA, "everyone else" is a role - as a potential speaker, a voter, and as the "people's mic." Using an electronic megaphone without a permit is illegal, and GA crowds are often large and in urban areas with a lot of background noise. The people's mic is OWS's answer to this problem – whoever is recognised by the facilitator to speak, speaks in short segments of three to 10 words at a time, then pauses while everyone who could hear the speaker repeats those words back, amplifying the message to those farther out. This process allows everyone to hear the speaker, but also forces people to speak slowly and understandably. The method of decision- making at OWS general assemblies is called "modified consensus". This means that for anything to pass a vote, it must have overwhelming support in the group, as opposed to a simple 51 percent. When a proposal is made, the facilitator takes a vibe reading from the crowd with hand signals. If everyone, or almost everyone gives the "like" signal, while no one gives the "dislike" signal, the proposal passes. If the signals are mixed a discussion over the proposal ensues. After discussion, the proposal moves to a vote. Using hand signals, people can vote for, abstain, or block. People are encouraged to block only if they are in dire opposition to the proposal passing, so much so that they might leave OWS if it did. A certain amount of block, usually between two and five people depending on the size of the GA, halts the proposal (overwhelming abstentions might also), while fewer blocks than that passes it. The first thing the GA passed was a code of conduct for OWS, most of it involving respect for everyone present and their possessions. “The way OWS is structured is really open, anyone can come in and take part,” Uruj Sheik, who has been organising with the occupation since its beginning, told IPS. “The way you become part of the occupation is by showing up and taking on a role – you can join any committee or come up with an idea of your own and organise people around that,” she said. And it’s free. This might seem obvious or unimportant, but possibly at the heart of many activists’ critique of the current system is the ubiquity of money. Money is necessary for virtually every transaction that makes life possible and enjoyable – from food and medical care, to living space and relaxing space, to communication tools, education, and entertainment. At OWS there is no money, other than donations. You can stay, eat, drink, relax, listen to music, read, talk politics, hang out, sleep or get a band-aid without having to worry about the monetary cost. To OWS activists, egalitarianism isn’t about everyone having the same amount of money, it’s about not needing money in the first place. Lily White, an emergency medical technician, founded the medical committee. “I started the medical tent on the second day when we had just a few people and a trash bag full of random supplies,” White told IPS. Organizational structure and decision-making in OWS are also constructed along egalitarian lines – so that everyone gets a say, no one’s voice is left out and everyone participates. The central structure to the occupation is the general assembly (GA). The GA is run at least once daily, and is an open gathering, discussion and the main decision-making body. But most of what goes on at OWS gets done in committees. Anyone can form a committee, and anyone can join a committee – their meeting times and places are posted publicly every morning. Examples of internal committees are food, which collects, purchases, stores and distributes food; sanitation, which takes on cleaning and hygiene; medical, which collects medical supplies, recruits professionals to give physical and mental care, and trains others to do the same; comfort, which organizes and distributes donated clothing, blankets, sleeping bags, pillows and the like; security, which ensures a safe environment for everyone; and facilitation, which gathers and trains people to be facilitators and stack-takers in GAs. Of these the food and medical committees are particularly salient, as they not only allow people to literally live at OWS, but because they provide services to the public that U.S. society at large does not, highlighting the way an alternative society could be geared. “This is an example of the type of healthcare our country could be providing to people, and we’ve organised it on the street in less than a month,” explained White. There are also external committees for organising actions, creating media and contacting media sources, internet outreach, coordination with community and labour groups, and so on. Then there are informal groups that make art and music, meditate, do street theatre, teach yoga, and all kinds of other fun things that contribute to a holistic life. 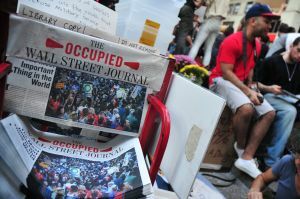 U.S.: Backlash Swells Against New "Gilded Age"
Video – OWS "Global Day of Action"
More than a month old, OWS feels like a town of its own, one governed intentionally by institutions and actions based on empathetic, egalitarian principles. As a protest, the occupation tactic is successful because of its constant presence and as a base for organising actions. But at least as important to participants is the opportunity the occupied space provides to organise a microcosm of the society they want to live in. As the movement continues to grow, it is clear that this new society resonates with many people disaffected with the failures of society at large. “We’re dismantling capitalism and building something better right here,” said Sheik.